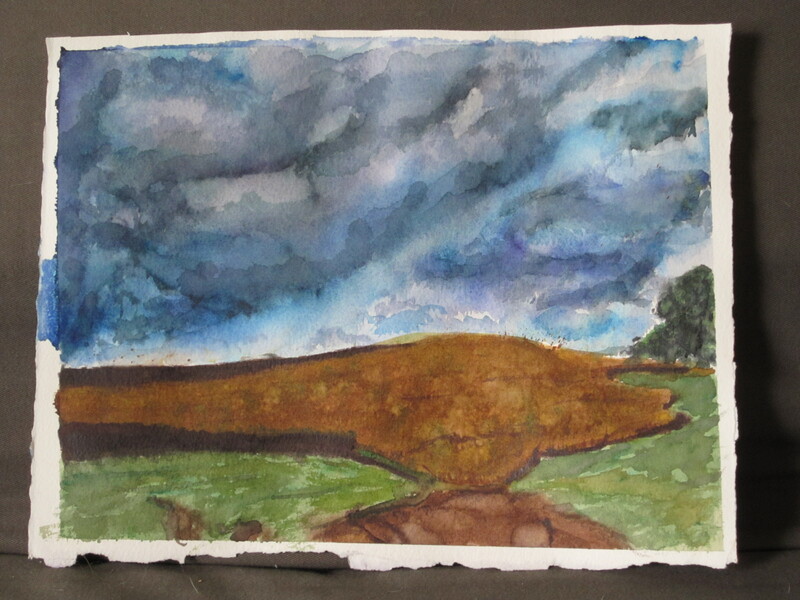 Prior to this weekend, I hadn’t painted anything since I finished the sky/cornfield scene. I was on vacation, then I took off a weekend, etc. etc. I figured I should get back on the wagon before I forgot everything I recently learned (I’m getting my tenses confused here a little bit, please forgive me). Well, I think it’s too late. Or, maybe it’s not too late, I’m just too impatient. I want to be awesome NOW. 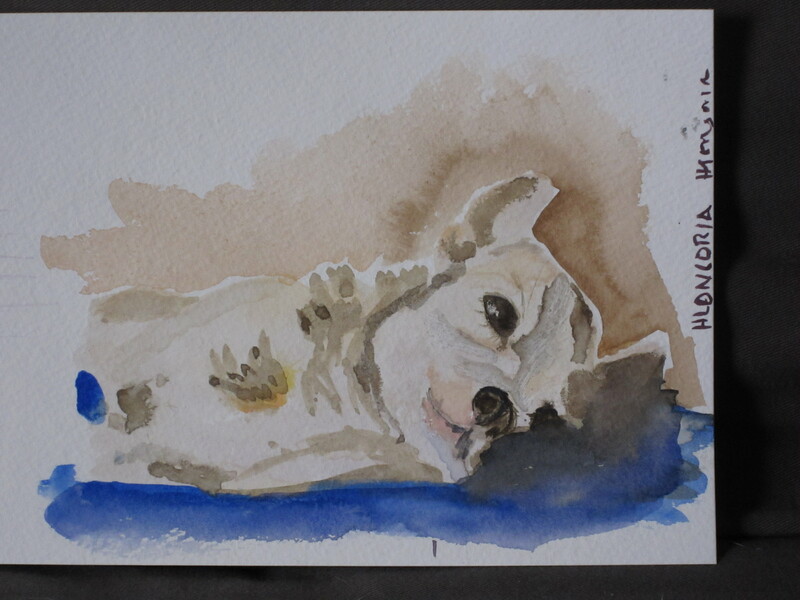 I realize I’ve only painted 2 watercolors in my life, but I still want every painting I attempt to turn out fantastic. But it’s not. or they’re not. or whatever. It is based on another amazing Benny Hageman photograph. At first glance, I thought this would be fairly easy to paint – it’s sky, corn, field. But, cornfields have an amazing variation in color, but the variation is on a tiny scale. I could get all the colors in there (orange, brown, yellow, purple), but not at the appropriate scale. I tried flicking the brush to get tiny dots of color, but I ending up flicking orange into the sky. And the sky, eff it, would not turn out the way I wanted!!!! The colors would not flow together. Argh. Primarily what went wrong was this – I got too impatient and just starting slapping colors on. 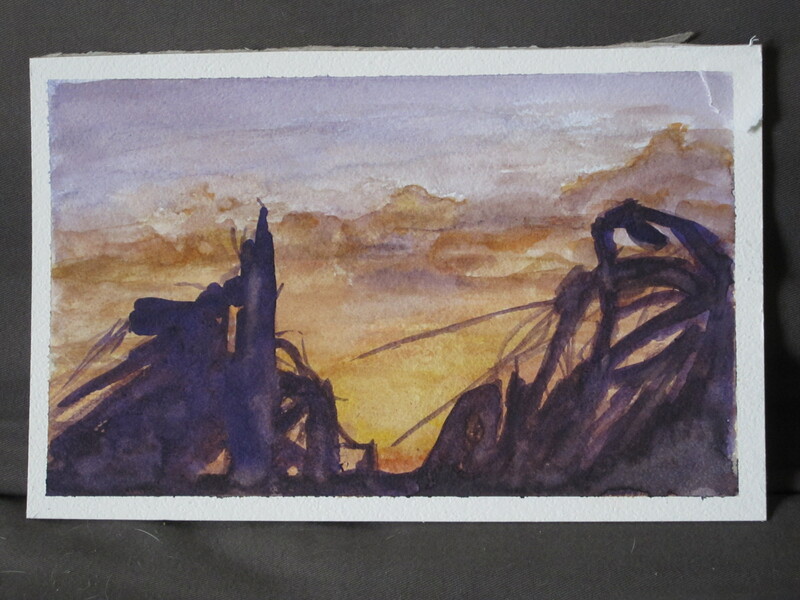 I did the sky first, and the colors didn’t flow together well at all. And, I couldn’t get peach. This sky is lavender and peach, and the peach was very elusive. It was teasing me and mocking me and being very annoying. I was also using “illustration board,” not watercolor paper. It doesn’t take the paint as well as watercolor paper. Also, you need to tape off the edges because if the edges get wet, water gets between the layers and ruins the painting. When I removed the tape, I ripped a corner of the picture. Before I put all my supplies away (or sold them on Ebay), I decided to do a little practice picture of Lucent. Mom gave me a really nice set of Van Gogh watercolors (I had been using the basic 8 color Prang set that they have you buy for elementary school), so I pulled those out. I wish I would have tried them sooner. The very first color I tried was the perfect peach I needed for the sky. Again, argh. I’m frustrated that nothing turned out the way it did in my head or in the pictures. But at least I got some practice in, and I didn’t end up just watching 8 episodes of Bones this weekend! I learned that I need to slow down and really focus in order to produce something of which I am really proud. I need to start working on another house painting. Today is nice and sunny, so maybe Tim and I can take a photography journey through Dport and see what inspiration we can find. You are learning so much with each exercise and I love the painting of Lucent. I also believe having good materials makes all the difference in the way a painting looks and in the ease of painting. Enjoy your practice! Thanks for the encouragement! I need it!